We provide professionally trained guide dogs for visually impaired, service dogs for persons with disabilities, and facility dogs who are specially trained to work with a professional in education, counseling, rehabilitation, and specialty agencies. I drove a forklift for 28 years until in 2009 I lost my eyesight. Not only did I lose my eyesight, but I lost my independence. This caused me such severe depression, all I could do was sit and stare into the world I felt I was no longer a part of. Eventually after a year of being mad at the world, a dear friend convinced me to look into getting guide dog. One day while shopping, I happened to meet a person using a service dog. That person told me to call the Kansas Specialty Dog Service (KSDS). The process of getting my dog was so enjoyable and gave me hope that I would get my life back. I'll never forget the day I met my dog. They had taught me that it make take some time before the dog would bond with me. I heard the trainer's van pull up outside. She took the dog out of the kennel and there was no stopping him. He pulled his trainer up to me and I suddenly had a full-grown yellow lab named Indigo on my lap and licking my face. This was a match made in heaven! My training and the rest of my life began on that day. Having my best friend, Indigo by my side has given me the ability to do all the things that before him, I never thought I would be able to do again. Indigo has helped me find my wife in a crowd,find our van in a full parking lot, cross a street safely, and navigate in and out of buildings. Not only does he help me with all of these activities that others take for granted, but he has guided me to a new hobby and even protected me from danger. Since we completed our training, I have competed in six 5K runs. I won first place in my age group. I am very thankful for KSDS and their efforts they put forth in matching me with Indigo. Your donation to KSDS means that someone with a disability will receive a trained assistance dog to give them greater independence. 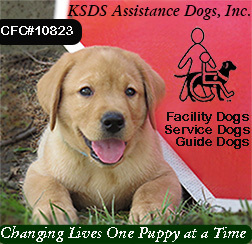 KSDS places guide, service, and facility dogs. These dogs are valued at $ 25,000, and as a 501(c) (3) non-profit, each is given away with no cost to the recipient other than a $25 application fee. WE ASK FOR YOUR SUPPORT SO WE CAN HELP OTHERS!